WASHINGTON — It was a faint signal, but it told of one of the most violent acts in the universe and it would soon reveal secrets of the cosmos, including how gold was created. 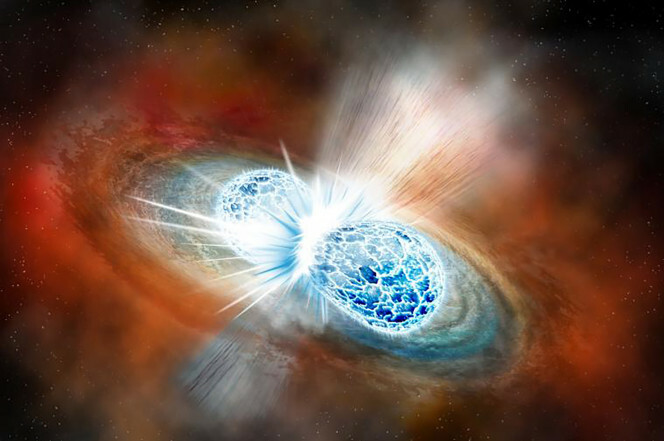 Measurements of the light and other energy emanating from the crash have helped scientists explain how planet-killing gamma ray bursts are born, how fast the universe is expanding and where heavy elements like platinum and gold come from. The signal arrived on Earth on Aug. 17 after traveling 130 million light-years. A light-year is 5.88 trillion miles. NASA’s Fermi telescope, which detects gamma rays, sent out the first alarm. Then, 1.7 seconds later, gravity wave detectors in Louisiana and Washington state that are a part of the LIGO Laboratory, whose founders won a Nobel Prize earlier this month, detected the crash. It issued a worldwide alert to focus telescopes on what became the most well-observed astronomical event in history. This time there was plenty to see, measure and analyze: matter, light and other radiation. The Hubble Space Telescope even got a snapshot of the afterglow. The colliding stars spewed bright blue, super-hot debris that was dense and unstable. Some of it coalesced into heavy elements, like gold, platinum and uranium. Scientists had suspected neutron star collisions had enough power to create heavier elements but weren’t certain until they witnessed it.